Kroboot, the autonomous duckweed eating boat developed by students from Delft University of Technology, is nominated for the Best Tech-idea of KIJK Magazine. The Kroboot team is based in RoboValley HQ, amidst our robotics start-ups. Click here to vote for the Kroboot! The robot was invented to tackle a huge problems in the canals of old cities in the Netherlands: duckweed. Besides being stinky stuff, duckweed kills all flora and fauna. The Kroboot automatically recognises duckweed with a camera and takes it out of the water to destroy it. In doing so, it finds its own way through the water. 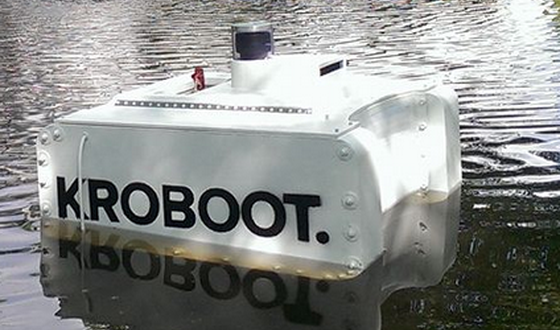 The Kroboot started as a minor robotics project of Delft University of Technology. Currently, the third prototype is underway. The Kroboot 3 is expected to make its maiden voyage in the spring of 2019.